There is nothing like a Brownie to satisfy a chocolate craving. This Low-Fat Brownie has a wonderfully moist and chewy texture with good chocolate flavor. Serve them plain, dusted with confectioners (powdered or icing) sugar, or topped with fresh berries and/or a scoop of low fat vanilla ice cream, frozen yogurt, or a fruit sorbet. Now when I say 'low fat' I mean that this brownie is much lower in fat than a regular brownie. So how do we make a brownie lower in fat? One way is to use unsweetened cocoa powder instead of semi sweet chocolate as semi sweet chocolate can have as much as triple the amount of fat as unsweetened cocoa powder. The reason for the reduction in fat is that cocoa powder is made when chocolate liquor is pressed to remove three quarters of its cocoa butter. For this recipe we are using Dutch-processed unsweetened cocoa powder which adds a rich chocolate flavor to these brownies. The second way to reduce the fat intake is to just use less of it. While most brownie recipes call for at least 1/2 cup (113 grams) of butter, this recipe reduces the fat to 1/3 cup (75 grams). Of course, then there is the question about the type of fat. If you are watching your cholesterol it is a good idea to find a substitute for butter (which is a saturated fat). So if you don't want to use butter, you can use a natural soft buttery spread (I like either Smart Balance® or Earth Balance®) that are made from oil. You will notice that I am not recommending stick margarines which were once recommended as a substitute for butter but that was before we knew that the trans fats (listed as either 'hydrogenated' or 'partially hydrogenated' oils) that are used to make margarine solid raises bad cholesterol (LDL) and lowers good cholesterol (HDL). We are also using light sour cream or a low fat plain yogurt instead of full fat. This brownie recipe is adapted from Canadian Rose Reisman's excellent cookbook Rose Reisman Brings Home Light Cooking. 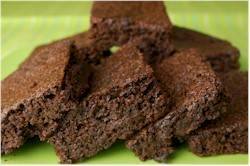 Low Fat Brownies: Preheat your oven to 350 degrees F (180 degrees C) and place the rack in the center of the oven. Spray an 8 inch (20 cm) square baking pan with a nonstick vegetable cooking spray and then line the bottom of the pan with parchment paper. In the bowl of your electric mixer, fitted with the paddle attachment (or with a hand mixer), beat the butter (or buttery spread) until smooth. Add the sugar and beat until creamy and smooth. Beat in the egg and vanilla extract. In a separate bowl, whisk together the flour, cocoa powder, baking powder, and salt. Fold this flour mixture into the sugar and butter mixture. Stir in the sour cream or yogurt. Remove from oven and place on a wire rack to cool. These brownies can be stored for about three days and can also be frozen for a month or two. * ®Smart Balance and ®Earth Balance are registered trademarks of Smart Balance Inc.